Step 1 Heat the oven to 350 degrees. Measure the oats, coconut, almond (or hazelnut or flaxseed) meal, sesame seeds, almonds, cashews, oil, maple syrup and salt into a medium bowl. Stir well to combine. Step 2 Spread the mixture on a lightly oiled cookie sheet. Bake for 15 to 20 minutes until golden brown, stirring once for even toasting. Step 3Cool the granola on the cookie sheet. It can be stored in an airtight container for up to a week. For each serving, combine one-half cup granola with one-fourth cup each plain yogurt and diced fresh fruit. In Recipes-list.com we have selected the most viewed recipes from category - Appetizers Breakfasts Vegetarian . Enjoy the best recipes specially selected for you! 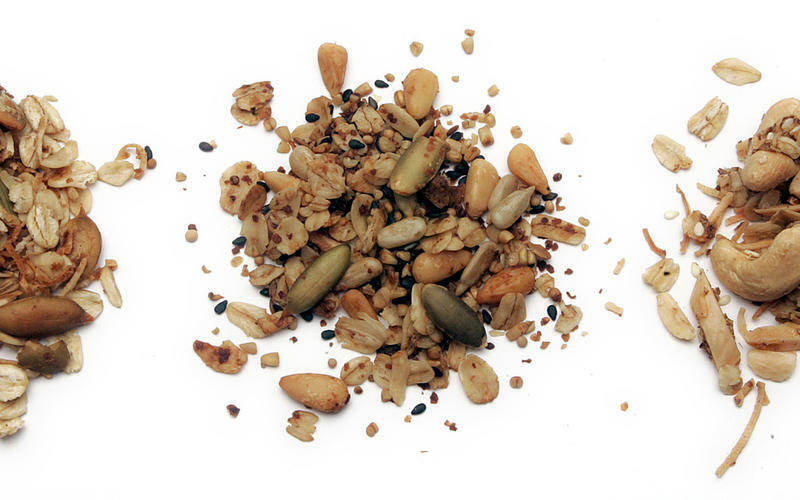 Almond-cashew granola is the right choice that will satisfy all your claims.